Certificate of Completion is e-mailed to every participant upon successful completion of the course. A special Certification of Completion is required by the New York State Education Department (NYSED) and is sent electronically to NYSED upon participants’ successful completion of the online course. Note: Please request a hard copy of the certification of completion form as the data exchange may be incomplete at times and a paper copy for your files is always recommended. Certain job titles require a special certificate of completion. Please consult with your supervisor and the New York State Department of Education website (http://www.op.nysed.gov/prof/) for requirements specific to your position. Otherwise, a standard certificate of completion is sufficient. For more information about who needs this certification, go to http://www.op.nysed.gov/training/camemo.htmExternal link opens new window. 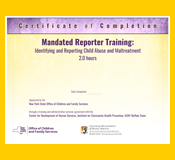 Special Note: Mandated Reporters who require licensure or certification through the New York State Department of Education (NYSED) are required to take mandated reporter training from a trainer who has been approved by the New York State Education Department. For more information, please go to: www.op.nysed.gov - External link opens new window or contact the New York State Education Department at OPPLEUCA@nysed.gov - Link to an email address.